They are a huge workforce which is often overlooked. They almost never take the centre stage in the society yet we reap the benefits almost on a daily basis of the hard labour they put in. 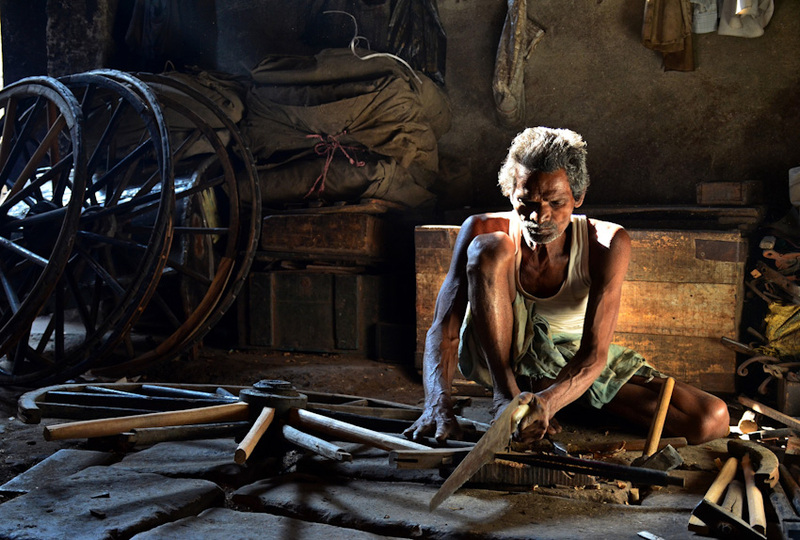 More often than not, they don’t receive their dues; their craftsmanship doesn’t bear any name on it and these artisans remain in oblivion throughout their lives. Such has been the story of working class people for centuries now. People belonging to this section of the society mostly perform blue collar jobs and mostly depend on wage labour usually on a day to day basis to earn their livelihoods. 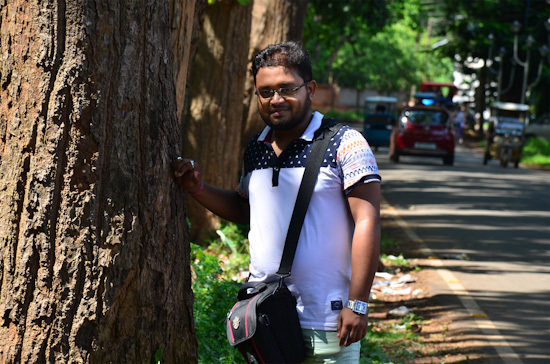 They work in conditions which are in stark contrast to the ones the urban youth workforce in the country is used to. The dingy alleys in the cities house age old decrypt buildings which are home to many small scale industries. It goes without saying the working conditions in these places is anything but suitable yet such establishments have been workplaces for the working class of people for generations. If they are not fighting the unfavourable work conditions then they are probably braving the elements of nature. People earning their livelihoods in the streets of the big cities, or in the fields and farms in the countryside too are faced with myriad challenges ranging from the whims of nature and its elements to the lack of proper facilities or equipment which make their task doubly difficult. The country has made tremendous progress over the last few decades, the modern cities in our country are blessed with the most modern amenities and technologies, yet it seems all these advances and progress have come at the expense of the well-being of these people. It is hard to imagine the situation of the working class of people have barely changed since generations when everything around them have undergone a sea of changes. Maybe all of us were so caught up in moving forward we never seemed to bother about who gets left behind, or maybe we took the contributions of this huge section of the society for granted and never took the time to appreciate them or truly value them for their efforts and hard work, and the significant contributions these people make in order to keep the wheels rolling. Yet they don’t complain, their demands are few and far between and certainly nothing compared to the much more privileged sections of the society. These people for centuries now have been silently working in the backstage for meagre returns, their produces are used extensively and there is not a single person who is not dependent on items which these hardworking people churn out of their shabby workplaces. The world has neglected them; they have every reason to feel they have been wronged by the society, the world around them; however they seem to be completely oblivious about these things. These humble, hardworking, honest people choose to focus their time and effort on their craft alone. This unbelievable dedication to their craft which stands firm even in the face of countless adversities defies all logic. The only possible explanation could be the deep seated connection which these people feel with their craftsmanship. 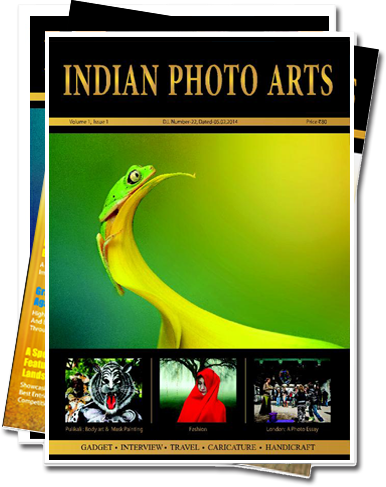 For some it is something which has been in their family for generations, while for others in can be the intoxicating feeling of shaping up something beautiful with their own tow hands. Whatever their reasons might be there can be absolutely no room for doubt that these are the people working day in and out in unsuitable often hazardous conditions, who keep the wheels of the society rolling and help in ushering in a new dawn seamlessly. Had it not been for these humble hardworking people the life which we are so used to, would have come to a screeching halt and despite all our privileges we would be looking up to these people to set the wheels in motion once again. 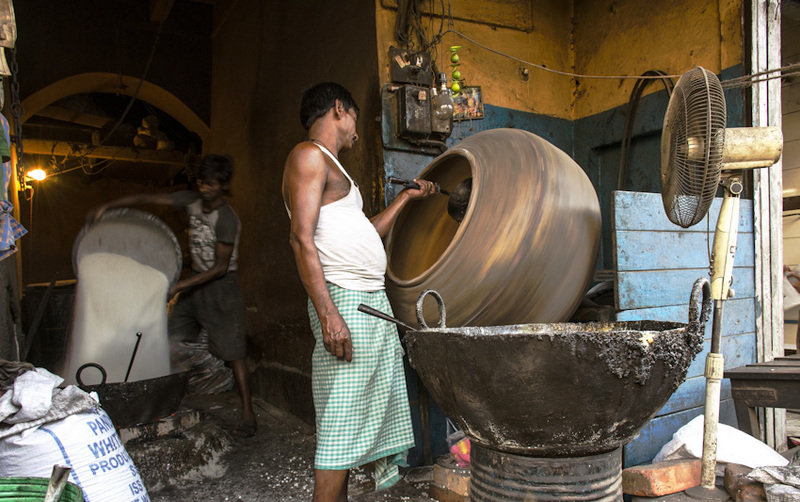 This is a small ode to these wonderful people with extraordinary skills, who in some of the narrow dingy alleys or by-lanes of Kolkata or in the sun baked fields in the suburbs of Bengal leave impressions of their wonderful skills and craftsmanship on a daily basis. 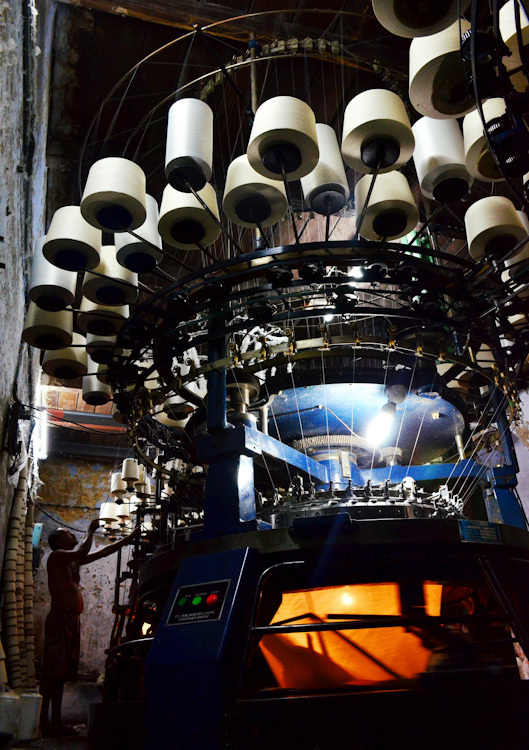 A giant machine capable of spinning out yards of cotton threads sits inside a shabby thread mill near Shobhabazaar in Kolkata. The fine quality of cotton threads available in the markets is a result of the patronage they receive from their makers, although somehow the same patronage has forever eluded the makers themselves. A scene from the interior of the same outlet. 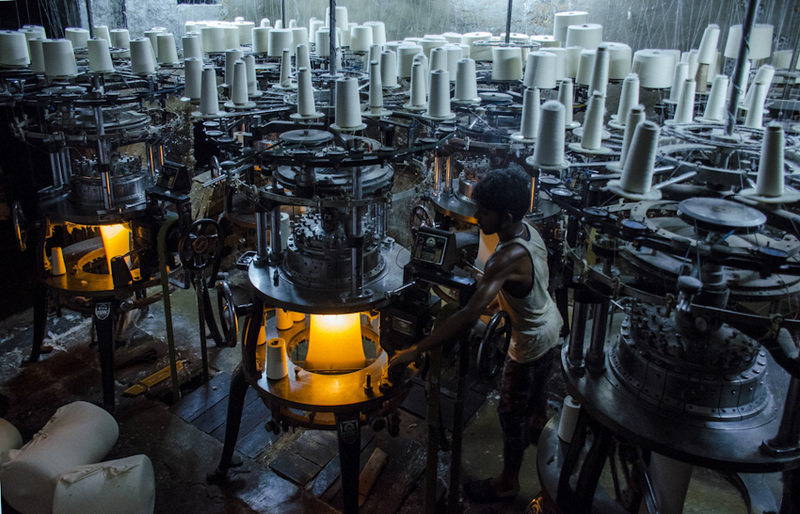 A worker makes sure one of the machines responsible for spinning out these cotton threads is in perfect condition. The parts of modern sanitary appliances and bathroom fittings have their humble origins in these damp, dark interiors where rugged hardworking hands shape them for their imminent posh future. 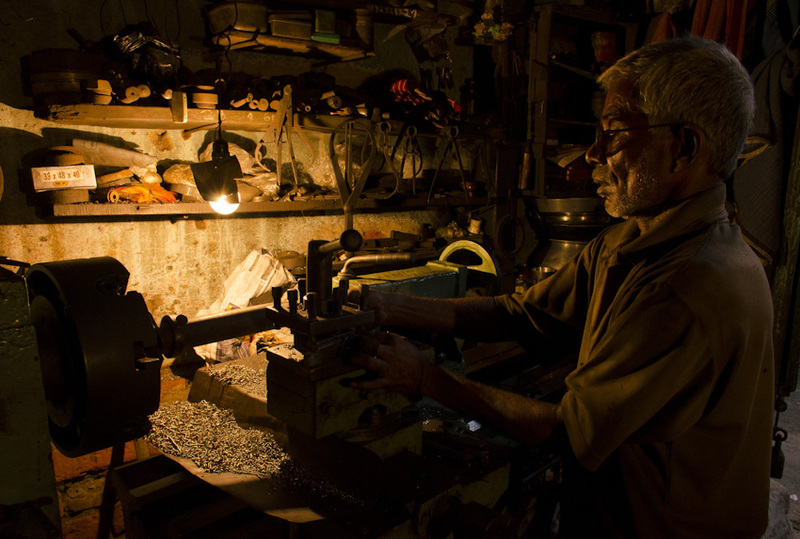 A worker inside the same workshop transforms metal chunks into finished products in his less than impressive workshop. The array of canes lined up against each other finds their way to the hands of thousands of pilgrims who undertake the arduous pilgrimage in the Bengali month of Shravan (August) marking the birth of Lord Shiva. 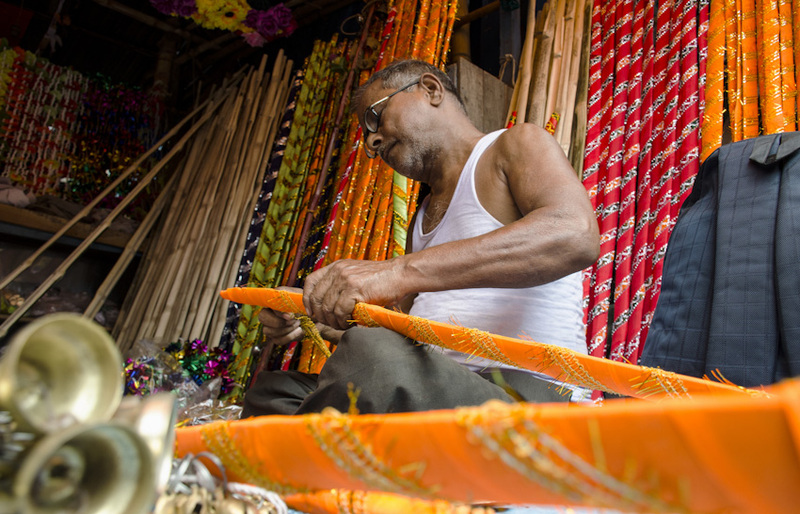 This man painstakingly wraps the individual canes in brightly coloured and ornamented pieces of clothing before devotees come rushing in with their ever increasing demands. 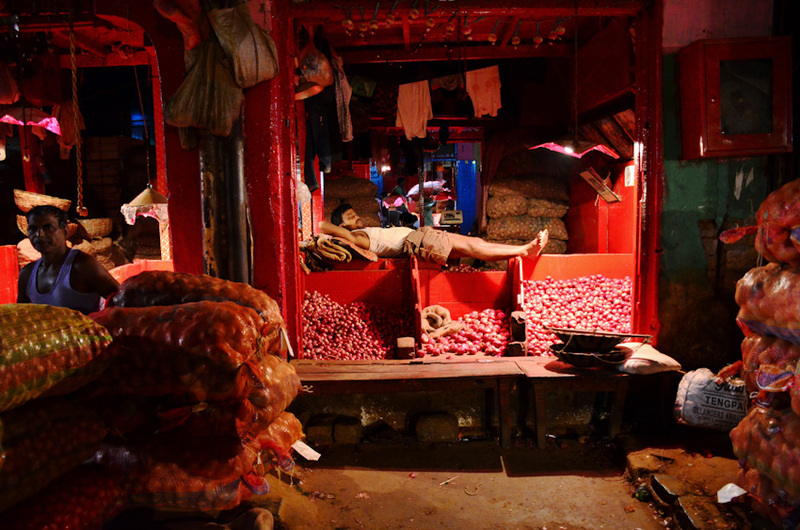 Workers inside a sweet manufacturing unit near Nimtala Ghat along the bank of the river. This decrypt outlet specialises in churning out a special sweet item locally known as “nakuldana” a common ingredient in puja offerings. 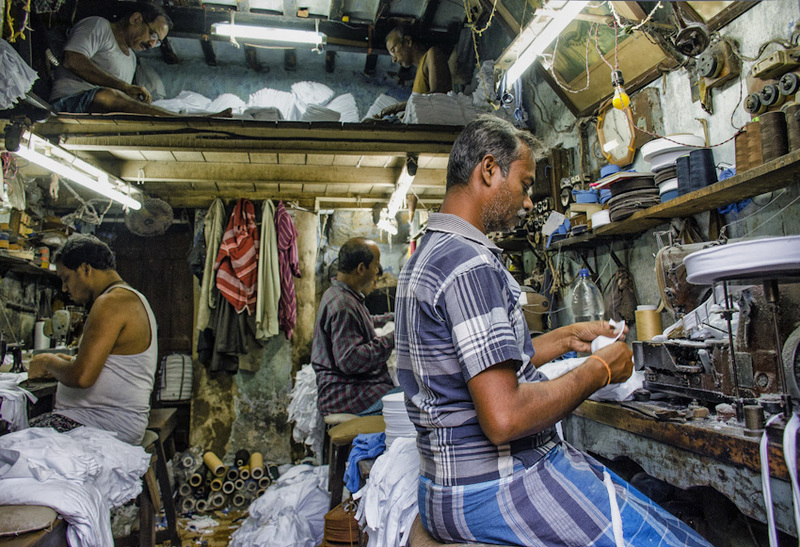 Cramped inside a remarkably tiny outlet in the Shobhabazaar neighbourhood of Kolkata, these workers spend long hour diligently weaving threads of cotton into vests which would flood the garment markets of Kolkata. These wooden cooking utensils grace the swanky kitchen cabinets of upscale properties in the city. 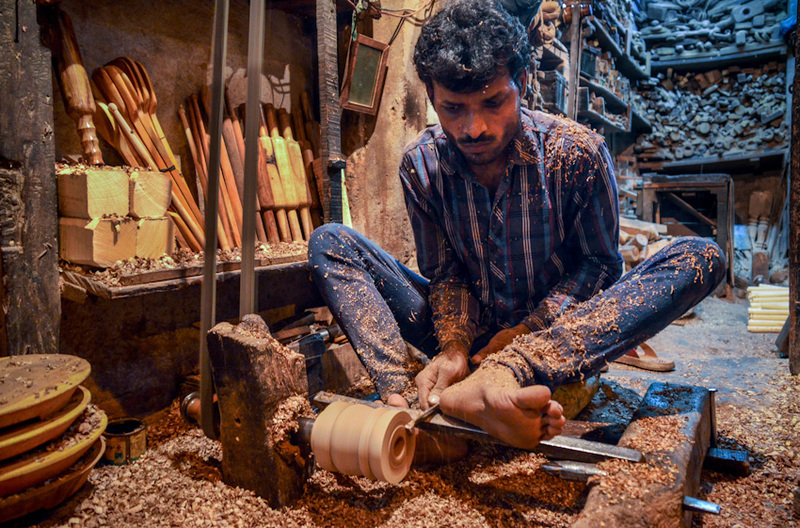 Once they become a part of these affluent households they seem to betray their humble past which lies rooted in these dusty workshops where the brilliant craftsmanship of workers like this man shape them up for a much glossier future, something which eludes the maker himself. 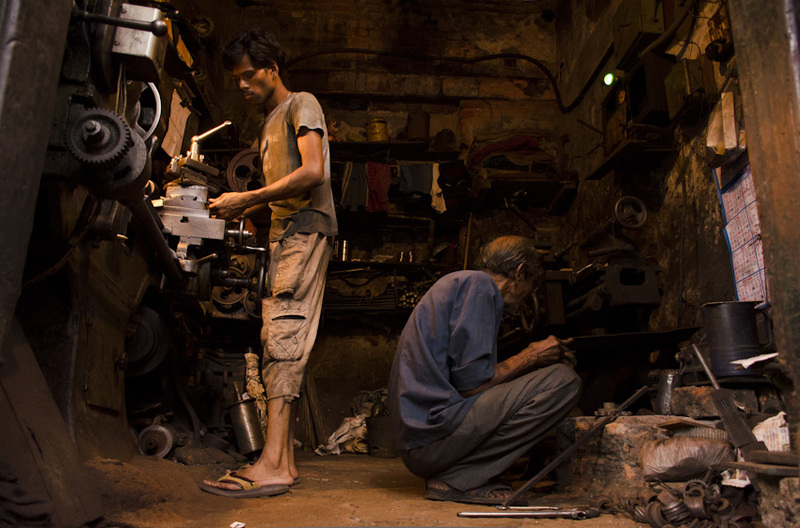 Hand pulled rickshaws are still the favoured mode of transport over relatively short distances for many in Kolkata the wheels of which find their humble origin in this dingy workshop in central Kolkata. 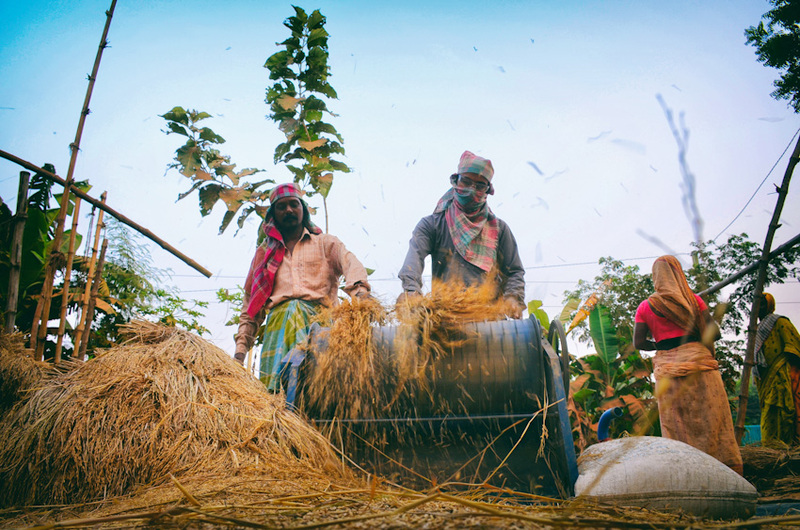 The fields and farmers in the suburbs of Bengal flourish throughout the year courtesy the back breaking labour put in by the farmers who brave the natural elements to keep their lands abundant with the bounty the earth has to offer. Koley market, a round the clock wholesale market in Kolkata provides the city with supplies to meet its insatiable appetite. This is a small glimpse into the daily life of the workforce which keeps this market alive and stacks our kitchen cabinets with the regular supply of groceries.